She doesn't sit on her trailer much. 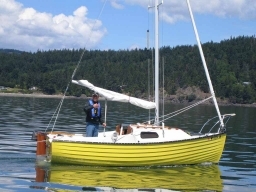 Since the refit was finished, she has been sailing many times in the Pacific Northwest: The San Juan Islands, Canadian Gulf Islands, Puget Sound, Deception Pass, Columbia River, Priest and Pend Orielle Lakes in Idaho as well as others. With a full time job which can get in the way, Larry manages twenty or more overnight stays aboard her each year. The list of items completed during refit are: Keel and centerboard reconditioned and faired, gelcoat restored, all deck fittings re-bedded with epoxy and re-fitted, new CDI roller / furler with new 150 Genoa, new 4 to 1 mainsheet, new pintles and gudgeons, new winches, jiffy reefing and lots more She has always drawn attention at the dock, launch ramp and even on her trailer. After all of the recent improvements... Larry says it's not quite the same. Now everyone thinks she's a new boat. Must be fun to comment that she is really 30 years old. Larry Yake's "CornDog" is an excellent example of an early M-17. She sports the smooth forward hatch, which many believe to be more handsome than the newer raised hatch model. Third row, upper left is the new Idasailor Marine tilt up rudder. The company creates rudders for lots of boats, including being the OEM producer for the West Wight Potter line of boats. Larry was the first to be provided with the new rudder assembly. In fact he was instrumental in the design. Larry says; "Sailing performance is excellent. The rudder has a forward stepped leading edge for more balance. It's shaped more like the original M-17 rudder designed by Lyle Hess. The kick up feature works as designed with no slop or spongy feel in the tiller... I endorse it whole heartily."